JANE: Before we launch into this week’s Tangent, Alan and I want to pause and raise a glass to Terry Pratchett, an author we’ve discussed frequently in these Tangents. If you’re interested, you can download a free e-book containing past Thursday Tangents here, so you can read them at your leisure. Alan, you are more organized than I am, could you remind me which Tangents deal specifically with Terry Pratchett and his works? ALAN: Certainly! Here they are, by date. JANE: Thanks, Alan, and thank you, Terry Pratchett for wonderful stories! Okay, Alan, you were going to tell me about how your and Robin’s relocation has been going. ALAN: Now that we’ve settled in to our new house, Robin and I have been exploring the nearby places and for the first time in a long time we’ve had to pay close attention to things like street names and the places they go to. JANE: Funny how that happens. To this day, I don’t know the name of a street I drive on several times a week. I just know it will take me to the nearest shopping center where there’s a branch of my bank and an Italian restaurant that makes great pizza and calzones. Still, you’re smart. You can read a map. I know from your “wot I red on my hols” column you even have a GPS. What’s the problem? ALAN: Well really it’s more psychological than actual, particularly since, for the very first time in my life, I’ve found myself in a city whose roads are laid out in a rectangular grid. This is quite a shock to the system. If I walk down the street, turn left, then left again and then turn left one more time I find myself back where I started. That’s never happened to me before and I find it quite unsettling. JANE: Now that’s interesting… Here in the U.S. grids are fairly common. We call those rectangles “blocks” and they can become such a part of way a neighborhood perceives itself that “block parties” are a way of referring to neighborhood gatherings. This isn’t as common where I live, since most yards are fully fenced, so there isn’t the same sense of all sharing the equivalent of a common back area. We live on a dead end street or, more accurately, I suppose, since it was designed this way, a cul-de-sac. Our houses all face the street, which gets little traffic. Over the years, we’ve gotten to be friendly with our neighbors. Right now, one of the houses has new occupants (the previous one died of cancer) and everyone is nervously waiting to see how this works out. JANE: Of course! Who wouldn’t want Harpo prowling through their yard? I still find the notion of a town built to a regular plan to be quite odd. The places I grew up in were all very old. In some cases, they’d been lived in without a break for a couple of thousand years or more, and stuff just grew higgeldy piggeldy. I suppose they plan things more carefully these days because that’s what councils do to justify their existence, but it’s hard to impose order on generations of random infrastructure. JANE: Although there are plenty of towns in here in the New World that expanded at random, I’d say planning was a lot more common. The Spanish, for example, planned cities around a central plaza, usually with a church at one side. The further you get from the center, the more chaotic the layout would get. Sometimes, later events would lead to changes, so, in Santa Fe, the church is now a block off the plaza, rather than, as originally, right on it. JANE: Oh… Wait! I just read that to Jim and I’ve got to wait for him to stop laughing. Being an archeologist, he always draws maps with contour lines. 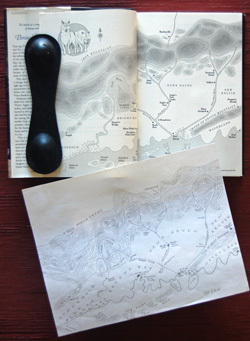 That’s why the maps in the Firekeeper books show elevations – he drew the originals. So the idea of city planners forgetting that all land is not perfectly flat seems hilarious to him. What happened to poor Wellington? ALAN: The builders struggled to fit the city to the original plan and they had to make a lot of compromises. They sacrificed public amenities such as parks, and somehow they managed to squeeze everything essential in. Then, in the middle of the nineteenth century there was a big earthquake and Lambton Quay, where the ships all moored themselves, suddenly found itself in the centre of the city and a lot of flat land that hadn’t been there the day before made itself available for building on. That helped a lot. JANE: Wow! That’s astonishing and just a little creepy. ALAN: As an added bonus, the earthquake also gave us an international airport and a place for Peter Jackson’s stage sets so he could film the Lord of the Rings and Hobbit movies. JANE: I’m assuming you mean a place to build these things, right? They didn’t just magically appear? ALAN: That’s right – but it makes a much better story if you assume that the shaking earth just handed them to us fully built. Next time we have an earthquake, it will probably take them away again. Sorry… Writers are like that. Everything’s a story. Speaking of which, I should go write. ALAN: But I’ve got a question for you! Oh, well. Never mind. I’ll ask it when you get back. This entry was posted on March 19, 2015 at 1:00 am and is filed under Thursday Tangents. You can follow any responses to this entry through the RSS 2.0 feed. You can leave a response, or trackback from your own site. I’ve never quite understood the human race when it comes to natural disasters and building things in the same area. As is indicated by the above, humanity is never 100 percent logical. Unlike Vulcans. What’s illogical about living with volcanoes? That’s where some of the best farming soil is, in nice fresh volcanic ash. Earthquake faults often bring springs to the surface, too. Most of the towns on the east side of the US San Francisco bay are located where the first settlers found springs, and all of those springs are located on the Hayward Fault (part of the San Andreas system). That’s why UC Berkeley is located right on top of the fault too, although it’s not why they put the virology lab next to the chemistry building across the street from the dorm that’s on top of the fault. That was just bad planning, and a great reason not to be in Berkeley when The Big One hits. Anyway, if you want to be safe, you could go to western Australia. I understand there’s rocks billions of years old there. Of course, it’s kind of flat and the soil’s a bit infertile, and there isn’t much company. But still, the ground won’t shake under your feet. As for grids, I’d recommend Spiro Kostof’s The City Shaped if you want to understand why some cities are laid out in grids. It probably wasn’t lost on Imperial English planners that grids first really showed up in the classical world, as the way colonies were laid out. To lay out a grid, all you need is a lot of rope and pegs, and someone who’s bright enough to lay out right angles. Classical colonies generally had walls enclosing them, and one classical design was the old Roman military fort. Many modern European cities were originally Legionary camps, laid out in a grid. In more modern times, cities have gone to the open grid, where developers could buy and sell standard-sized lots, and the city could expand in perpetuity…or until it ran into an obstacle. Trouble is, grids aren’t the most efficient way to handle lots of traffic, so over time, they get remodeled more organically to improve traffic flow. A great example of this is LA’s freeways, which were overlaid on a massive number of competing development grids, just to make it possible (in theory) for people to get around better. Western Australia is ancient geographically and therefore pretty flat and infertile and even sparsely populated, but in 1968 there was an earthquake ( 6.9) that destroyed the little town of Meckering about 130km east of Perth! Turns out that the area there is the most seismically active in Australia. Who knew? I was in Perth at the time and remember it well, the house seemed to shake for ages and things fell off shelves. My hometown of RIchland, Washington, is mostly a grid. Generally, there aren’t enough hills to affect the grid. However, there are two rivers in town–the Columbia and the Yakima. On the other hand, essentially the entire town was built since World War II (there are older communities in the area, though). Richland was mostly built to support the Hanford Site, where the Army was making plutonium for the Manhattan project. So the city was laid out and planned pretty strictly. The more recent developments are starting to sprawl out and get ugly (in my opinion). We’ve also been invaded by vineyards, which appear to be metastatic. It’s all about risk perception, isn’t it? I’ve known people who were freaked out about living in California because of the big scary, extremely rare earthquakes. For most people, though, by far the most dangerous thing in their lives is their driving habit, but most people not only refuse to be sensible about minimizing their risks while driving, they demand more road space and higher speeds. Rationality and risk perception seem to be two different issues. Alan, was that the same quake that left Napier high and dry? [I can’t remember when they said that happened] If not, the North Island seems to have a habit of expansion via self-elevation. I’m not sure — the fault line does run from Wellington up through the Hawke’s Bay and there was a big earthquake in the Hawke’s Bay in 1863. But probably the 1931 quake in Napier was the biggest in the area. It was 7.8 and caused enormous damage and a lot of casualities. Napier was largely rebuilt from scratch afterwards and became the beautiful art-deco city that we know and love today. I think it was the ’31 quake that did it. That rings a bell. The locals told me that it raised the waterfront some ridiculous amount – 30’+ comes to mind, but I’d need to check, since it was almost 40 years ago that I was there.